The nation affectionately calls him “Mahatma “, “Bapuji” and “Father of the Nation”. Yes, Mahatma Gandhi was the one who led India’s freedom struggle. He was born Mohandas Karamchand Gandhi on 2nd October 1869, at Porbandar in Gujarat. His school life years were spent in Rajkot. Later, he went to England to become a barrister. Gandhiji then went to South Africa to practices law. There he saw how inhumanly the Government treaded the Indians and the blacks. He took up their cause and protested against the government. He was able to get some reforms passed for the Indians living there. It was in South Africa that he developed a new method of opposing injustice, known as “Satyagraha. This was a form of non-violent struggle against injustice. Mahatma Gandhi returned to India in 1995 and joined the nationalist movement. After the death of Lokmanya Tilak, Gandhiji took up the leadership of the freedom struggle against the British Government. He also fought against various social evils in India. He fought particularly against untouchability and worked for Hindu-Muslim unity. Gandhiji stood for the principles of truth, equality, justice, non-violence (ahimsa) and brotherhood. He was assassinated on January 30th, 1948 by Nathuram Godse. His teachings are valid and valuable even today. The nation will always remember him and respect him. Mahatma Gandhi’s views about education are important. He laid stress on the dignity of labour and on learning by doing. Mahatma Gandhi wife name was Kasturba Gandhi. 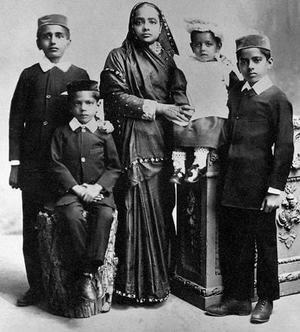 Bapu has four children, Harilal, Manilal, Ramdas, and Devdas. After the death of Lokmanya Tilak in 1920, the reins of the national movement passed on to Mahatma Gandhi. Under his influential leadership, the base of national movement widened further. A new phase began in the Indian freedom struggle. Gandhiji began his work in South Africa. In Africa, the black people and the Indian residents were subjected to injustice and tyranny by the British Government. Mahatma Gandhi opposed this injustice and secured justice for the people there by leading them on the path of satyagraha. Gandhiji used the novel technique of satyagraha for the first time in India. The aim of satyagraha is to make the person who inflicts injustice on others aware of the truth and justice of the matter and thus to bring about a transformation in his or her opinion. Gandhiji decided to launch the salt satyagraha at Dandi in Gujarat. On the 12th of March, 1930 Gandhiji set out from Sabarmati Ashram with 78 of his followers for launching the salt satyagraha. Along with others, Sarojini Naidu and Mithuben Petit also accompanied him. In his march from Sabarmati to Dandi covering a distance of 385 kilometers, people joined him in very large numbers. On the 6th of April, Gandhiji picked up the salt on the seashore at Dandi and broke the Salt Act. From this incident, Nationwide Civil Disobedience Movement began. Mohandas Karamchand Gandhi is also known as the “Father of the Nation”. Most Indians call him “Bapu” out of their loves and affection for him. He was born on 2nd October, 1869 at Porbandar in Gujarat. His father was the Diwan of Rajkot. He got married to Kasturba, when he was only 12 years old. He was sent to England for higher studies. Gandhiji returned to India as a barrister in 1891. In 1893, he went to South Africa. There he fought for the rights of the Indians. Gandhiji lived like a saint. He was a true example of “Simple Living and High Thinking”. Even in free India he did not accept any post. He was a good writer too. He edited a newspaper. “My Experiments with Truth was written by him. Gandhiji was shot dead on 30th January, 1948 by Nathu Ram Godse. The Father of the Nation passed away, leaving behind a sad nation.